Amelia Earhart, the famous pioneering pilot, set many flight records. Her mysterious disappearance has endured in the American consciousness. Amelia was the most famous female aviator, a best selling author, designer of a line of clothing and accessories, public speaker, and heroine to many. In 1928 she was the first woman to fly as a passenger across the Atlantic Ocean. In 1932 she became the first woman to pilot a plane across the Atlantic. Amelia embarked on her around-the-world flight at the Equator in June 1937 with Fred Noonan as her navigator. 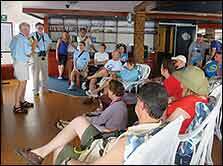 On the third to the last leg, from New Guinea to Howland Island, she and her navigator went missing. An extensive search by air and sea turned up no trace of her or the plane. Many theories have surfaced over the years, one that she landed on uninhabited Nikumaroro Island south of Howland Island and perished. "You can join a trip that aims to solve the Amelia Earhart mystery"
Expedition may be coming in 2019....We will let you know. Certainly the Amelia Earhart expedition to Nikumaroro in 2019 is the most amazing trip we have ever offered, and it was extraordinary in 2017. So worthwhile, and attracting a fantastic group of participants. In 2017, we invite you to explore one of the greatest mysteries of the 20th Century on this Voyage in Search of Amelia Earhart! This will be our second voyage to Nikumaroro. Our voyage in 2015 was a resounding success and we hope you can join us in 2017! We developed this trip in association with TIGHAR, an organization which has been searching for Amelia Earhart for the last 25 years. 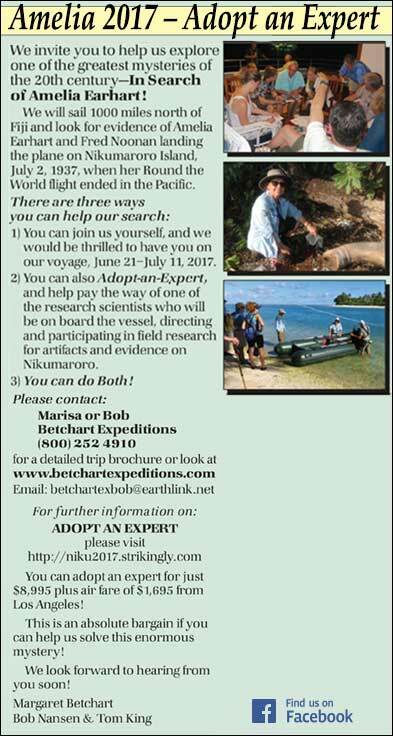 The 2017 trip will be a first opportunity for you and other new team members to explore Nikumaroro. It will also be an opportunity for 2015 travelers to return with us and continue to investigate the mysteries in the Colonial Village, the Camp Zero site, the Seven Site, and more! Our 2017 trip will again begin with flights from Los Angeles to Fiji where we will have a hearty welcome and introduction to the trip. The next day, we will board our ship and head to Rotuma Island, a cultural jewel just a day’s sail north of Fiji. We relish the opportunity to meet our friends on Rotuma again! 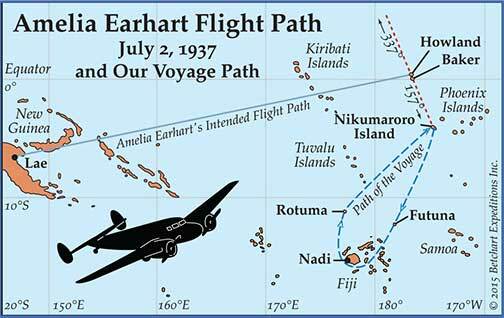 We’ll then continue our 1,000 mile journey to Nikumaroro (formerly Gardner Island) where TIGHAR believes Amelia Earhart’s plane landed (see the brief summary of evidence in this brochure). We’ll be traveling to one of the most remote parts of the Pacific Ocean—the Phoenix Islands Protected Area (PIPA) where Nikumaroro is found. It is the largest marine sanctuary in the world and has untouched coral reefs. We’ll have lectures on what we know about Amelia Earhart’s disappearance, and what TIGHAR’s research suggests has happened. We will also learn about Pacific Ocean coral reefs, oceanography, island ecology, and the cultural heritage of the people of Melanesia and Polynesia. At Nikumaroro, we will divide into teams (with TIGHAR and Betchart leaders) to explore the island, lagoon, and reef edge. There will be opportunities for swimming, snorkeling, kayaking, and scuba diving at Niku. 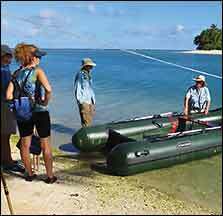 Teams will boat and walk to the main sites identified on past TIGHAR research expeditions. One focus will be exploring a location at the Seven Site where our 2015 fieldwork, combined with TIGHAR’s previous research, suggests might be the spot where Amelia Earhart died. The voyage will give you amazing insights into the vast amount of work TIGHAR and our travelers in 2015 have done In Search of Amelia Earhart. And who knows, we may find missing pieces of the puzzle about Amelia Earhart’s disappearance!